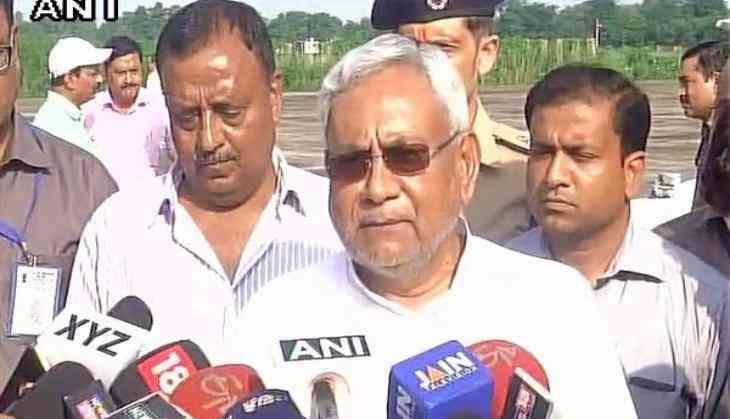 Bihar Chief Minister Nitish Kumar on 14 August took stock of flood affected areas in the state and assured that the relief and food camps were being conducted in the area for those in need. "The relief and food camps were conducted in the area. I have also called a meeting now so that I can order them what is to be done next. Tomorrow, we will send chief secretary of Disaster Management, road construction department, Rural Works Department and all DMs to assess situation. The rescue and relief operation have been going on. We had asked for IAF helicopter to distribute food packets," he said. Earlier in the day, Prime Minister Narendra Modi spoke to Nitish over the phone regarding the flood situation in Bihar. The Prime Minister's Office (PMO) took to Twitter saying that, "PM @narendramodi has spoken to Bihar CM @NitishKumar regarding the flood situation in parts of the state. Prime Minister Modi also expressed his grief for the affected people and assured that the situation is being monitored. "My thoughts are with all those affected by floods in parts of Bihar. The situation is being monitored closely". Three columns of Army were deployed in flood-hit Katihar district for the relief and rescue operation. The central help came after Nitish sought help of the Army and Air Force as the flood situation worsened in the state. Overflowing rivers from Nepal have played a major spoilsport in four northeastern districts - Kishanganj, Araria, Purnia and Katihar. Supaul, Saharsa, Bagha, Gopalganj, Madhubani, Sitamarhi, Khagaria, Darbhanga and Madhepura districts are the other districts which have been affected by floods. Lakhs of people have been affected in these districts.